We’d love your help. 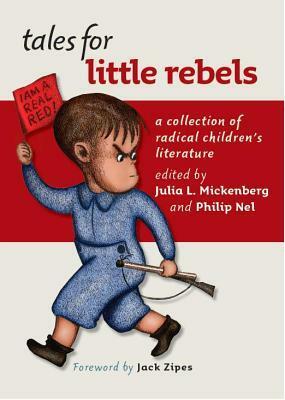 Let us know what’s wrong with this preview of Tales for Little Rebels by Julia L. Mickenberg. Check out this interview with the author on C-SPAN! In 1912, a revolutionary chick cries, "Strike down the wall!" and liberates itself from the "egg state." In 1940, ostriches pull their heads out of the sand and unite to fight fascism. In 1972, Baby X grows up without a gender and is happy about it. Rather than teaching children to obey authority, to conform, or to seek re Check out this interview with the author on C-SPAN! In 1912, a revolutionary chick cries, "Strike down the wall!" and liberates itself from the "egg state." In 1940, ostriches pull their heads out of the sand and unite to fight fascism. In 1972, Baby X grows up without a gender and is happy about it. Rather than teaching children to obey authority, to conform, or to seek redemption through prayer, twentieth-century leftists encouraged children to question the authority of those in power. Tales for Little Rebels collects forty-three mostly out-of-print stories, poems, comic strips, primers, and other texts for children that embody this radical tradition. These pieces reflect the concerns of twentieth-century leftist movements, like peace, civil rights, gender equality, environmental responsibility, and the dignity of labor. They also address the means of achieving these ideals, including taking collective action, developing critical thinking skills, and harnessing the liberating power of the imagination. Some of the authors and illustrators are familiar, including Lucille Clifton, Syd Hoff, Langston Hughes, Walt Kelly, Norma Klein, Munro Leaf, Julius Lester, Eve Merriam, Charlotte Pomerantz, Carl Sandburg, and Dr. Seuss. Others are relatively unknown today, but their work deserves to be remembered. (Each of the pieces includes an introduction and a biographical sketch of the author.) From the anti-advertising message of Johnny Get Your Money's Worth (and Jane Too)! (1938) to the entertaining lessons in ecology provided by The Day They Parachuted Cats on Borneo (1971), and Sandburg's mockery of war in Rootabaga Pigeons (1923), these pieces will thrill readers intrigued by politics and history--and anyone with a love of children's literature, no matter what age. Check out co-editor Philip Nel discussing this book on NPR here. To ask other readers questions about Tales for Little Rebels, please sign up. True story. My husband's best friend was dating a red diaper baby and one weekend we decided to stay in her parents' cabin. Not entirely grasping her upbringing to its fullest extent we were amazed and delighted when we stepped into the home to find it cover from tip to toe in amazing radical Socialist publications and decorations. As a children's librarian, however, my interest lay entirely in her old bedroom, still home to a fine selection of left-wing children's literature. It wasn't a large True story. My husband's best friend was dating a red diaper baby and one weekend we decided to stay in her parents' cabin. Not entirely grasping her upbringing to its fullest extent we were amazed and delighted when we stepped into the home to find it cover from tip to toe in amazing radical Socialist publications and decorations. As a children's librarian, however, my interest lay entirely in her old bedroom, still home to a fine selection of left-wing children's literature. It wasn't a large selection, however, and I was a bit disappointed not to find much beyond a cursory introduction to Russia. Into this void slips Mickenberg and Nel's dual scholarship. A ribald, witty, sometimes fun, sometimes thoughtful examination of a wide swath of too little known literature, Tales for Little Rebels gives a thorough child-centric going over to everything from gender politics and African-American poetry to Leninism, Stalinism, Marxism, and all the other "isms" you could name. You will find nothing else like this on the marketplace today. Nothing quite as engaging, certainly. In his Introduction professor Jack Zipes states, "A radical literature, especially a radical children's literature, wants to explore the essence of phenomena, experiences, actions, and social relations and seeks to enable young people to grasp the basic conditions in which they live." So it is that professors Julia Mickenberg (Associate Professor of American Studies at the University of Texas) and Philip Nel (Professor of English and Director of the Program in Children's Literature at Kansas State University) have sought out and brought together a collection of too little known texts on a variety of different topics. The profs separate the book into eight different parts: R is for Rebel, Subversive Science and the Dramas of Ecology, Work Workers and Money, Organize, Imagine, History and Heroes, A Person's a Person, and finally Peace. Each section contains text from a variety of different titles as they relate to the subject. For example, within the "A Person's a Person" section you might read a story by Langston Hughes about a boy in a big city, an original text of Dr. Seuss's infamous The Sneetches, a powerful critique of McCarthyism via Pogo, a look at that most peculiar and amusing of picture books X a Fabulous Child's Story, a wonderful retelling of The Princess Who Stood on Her Own Two Feet, and an excerpt from the tale Elizabeth: A Puerto Rican-American Child Tells Her Story. And that's just within a single section! When reprinting picture books, the editors make an effort to include many of the illustrations. When reprinting selections from longer texts, an equal effort is made to reprint whatever visual images accompany it. The end of the book consists of "A Working List of Recommended Radical Books for Young Readers," just in case you need some extra reading when all is said and done. Interestingly, the book diverges from your average scholarly texts with its assumption that parents are naturally going to want to share these stories with their kids. For example, at one point the book states that "cries of `Down with capitalism! Long live the Soviet!' demand a fair amount of explanation - so much so that parents may want to avoid sharing Donn's rhymes with very young children." The editors are both encouraging these stories to be used for the purpose for which they were intended, and warning parents off of the more dated aspects. This is a rather singular thing to do, but it isn't too surprising when you stop to think about it. Nel has always had a penchant for combining scholarship with use. His republication of Crockett Johnson's Magic Beach was both a historical document and a legitimate picture book in its own right. Likewise the very notion of an The Annotated Cat in the Hat sounds ridiculous on paper, but Nel found a way to make even an easy reader both a great story and a singular piece of research. Tales for Little Rebels just follows suit. In terms of books that sought to highlight or honor a variety of ethnic groups, Mickenberg and Nel point out that a vast chunk of those writers were white as the newly driven snow. To make up for this, they've been careful to include backmatter for further reading of those race's authors. Those that are featured, however, don't mess around. I've always had an ingrained respect for Julius Lester's work, but that may have had as much to do with the fact that the man's a legend than anything else. Having read his story High John the Conqueror from the 1969 book Black Folktales I find my uninformed respect replaced by jaw-dropped bug-eyed shocked respect. Oh man. If you read no other story in this book, read this one. You have never NEVER read a folktale like this. It's raw. It's like the Richard Pryor of folktales. I almost have a hard time believing that it even got published. But these were different times, and now that I've found it I can't wait to read the rest (and this in spite of Zena Sutherland's scathing critique labeling it "a vehicle for hostility"). Of course, there was at least one type of children's literature that did not make the cut. The interesting omission of post-apocalyptic texts may be due more to the fact that the book is concentrating primarily on picture books than anything else, but it's still a definite gap. A cursory glance at children's fiction shows that dystopian novels are a very strong and distinctive genre in and of themselves and one that is sadly lacking from this book. After all, even The Lorax could be considered an end-of-the-world tale, if examined in the right light. Yet Mickenberg and Nel eschew the "toldja so" school of thought, leaving me to wonder why that is. The term "dreary dogma" is invoked by Little Rebels to typify the kinds of didactic literature kids too often are forced to read quote unquote for their own good. Little Rebels is a conscious effort on the part of its editors to escape such ingrown dreariness. The stories told here for the most part crackle with energy and hope. Some are distinctly more imaginative and clever than others too. For example, while I found myself growing very fond of The Practical Princess by Jay Williams and even the Amalgamated Clothing Workers of America's Mary Stays After School or - What This Union's All About, other texts just don't stand close scrutiny. A play called The Beavers by Oscar Saul and Lou Lantz, for one, is written in an odd herky-jerky style that resists all attempts to read it smoothly from the page. When you finish the book, what remains notable about it is the fact that Mickenberg and Nel aren't poking fun at their subject matter. Finding abecedarian texts that contains lines like "K stands for Kremlin where our Stalin lives; L is for Lead he so ably gives," leaves the writer wide open for criticism. Instead, the editors choose to place each text within the context of its time. They acknowledge that some ideas in this book have veered too far in one direction without question, and that this is never a good idea, particularly when it comes to children's literature. But as the book so ably states, right from the start the 1667 book A Guide for the Childe and Youth was ideological. The urge to instill our values in our children is ever with us. And what Tales for Little Rebels does so succinctly is to gather a representative sample of different kinds of ideals and show how many of them successfully brought about the world we live in today. "Can you read this?" My husband, a first grade teacher, hands me a test that says to circle one of the pictures and explain what features help the animal to live in its habitat. This first grader circled a dolphin and wrote, "They have ckowlowcashine. They live in the sea. They need to breath arr." "Well, it has to do with a dolphin," I replied handing it back. "Ah! I know... she means 'They have echolocation.'" He laughs at my gaping jaw and explains, "We teach them that bats and dolphins use e "Can you read this?" My husband, a first grade teacher, hands me a test that says to circle one of the pictures and explain what features help the animal to live in its habitat. This first grader circled a dolphin and wrote, "They have ckowlowcashine. They live in the sea. They need to breath arr." "Well, it has to do with a dolphin," I replied handing it back. "Ah! I know... she means 'They have echolocation.'" He laughs at my gaping jaw and explains, "We teach them that bats and dolphins use echolocation to find food." What a great reminder for me that just because young children can't express themselves in sophisticated language systems, does not mean that they can't understand more than adults think. This book highlights radical writers who believe this too, and as such, have used the childrens genre as a vehicle for politics with the goal of effecting change in society and questioning the existing social hierarchy. This is not a book you are going to sit down and read with your kid. You might read some of the stories, but many might find the language stilted or the black and white illustrations unappealing or the topics too adultish. While this book is thought-provoking and unique in its topic, it was hard for me to get through and I went into skim mode several times. I only found some of the stories interesting and gravitated toward the more familiar writers. Given that most of the 43 items composed of stories, comics, primers, and poems were out-of-print or from lesser-known authors is one reason I didn't love the book in its entirety. This is personal taste and does not reflect on the quality; there's no doubt this is well-written and scholarly. If you love, love, love the history of children's books, then add it to your bucket list. You won't be disappointed. The book is divided into 8 parts that cover the historical breadth of radical works with topics of literary themes, science and technology, economics, subversive messages, missing historical narratives, and societal prejudices. Part 3 on "Work, Workers, and Money," was one of my favorites as it showed how radical writers bucked the trend of glorifying industrial production and the person in power to focusing on the worker. Langston Hughes "Sharecroppers" shows the tenant farmer working for an overseer who keeps the profits and "The Little Tailor," by William Gropper that has a tailor working in a factory on an assembly line. Both show their labors do not allow them to own their products or find happiness in their strenuous work. Unlike most books during the early 1900s that glorified industrial production, these authors questioned it. These stories made me think of today and how computers are replacing people and books to some degree. The contemporary novel by John Scieszka shows this shift in technology as the protagonist, an old rusted cell phone called "Robot Zot" comes to earth and falls in love with a toy cell phone. Perhaps it is a comment on consumerism as Zot zaps household items in the house with his ray gun, as well as, a parody on romance tales. Lane Smith's "It's a Book" is another radical book that shows how technology is causing kids to not read, along with "Goodnight iPad," a parody of children saying goodnight to their technology devices. These books make me question what I consider the norms of how technology effects society today. My favorite story in this book was "Johnny Get Your Money's Worth," by Ruth Brindze which reveals how advertising by a company gets kids to buy their candy. (I'm sure this appealed to my journalism side.) The piece is written for adults and reads more like an article than story but is meant to get people to think critically about consumerism. The company advertised a free bike to kids if they collected 700 wrappers in 4 months. If you do the math that means a kid would have to eat 5 candy bars a day. As she says it is "first-rate advertisement" for the company in getting them addicted to their chocolate bars. This made me think of the book, "Betty Bunny Loves Chocolate" and "Betty Bunny Wants Everything," by Michael Kaplan, a humorous look at a child who doesn't know when to stop eating chocolate or buying all the toys in the store. David Shannon's "Too Many Toys" is a comment on the consumerism that has many children with "mountain's of toys". Much of what the authors point out can be found today and for me this was the strength of the book. History doesn't really change. There will always be inhumanity, prejudice, war, environmental, economic, and societal issues. This is a book that could be written many times over and while I found it quite compelling I didn't love it. - "Mary Stays after School or--What This Union's About" put out by the Amalgamated Clothing Workers of America during a 1939 strike. Well-constructed story in which a very practical fairy helps a little girl to realize that her parents are the real heroes, and stick it to the capitalist brats in her class. - "Mr. His: A Children's Story for Anybody," written by Syd Hoff using his 1930s lefty pseudonym of A. Redfield. As hilarious as his later work; someone should arrange with Hoff's estate to put the "Redfield" books back into print. - "Why?" from "Fairy Stories for Workers' Children" by Herminia Zur Mühlen. Left me wondering if all of Zur Mühlen's work had been translated into English, and if it would be possible for a lefty publishing house to bring "Fairy Stories..." back into print. - "A Little Hen Goes to Brownsville" by Yehoshua Kaminski (1937, originally in Yiddish). Hilarious and very Jewish; I could imagine my great-grandmother telling the story (though I know in reality she read American romance novels to my grandmother and great-aunt, not children's books and certainly nothing in Yiddish). I want to download Kaminski books off the Yiddish Book Center website and translate them all for the kids. - "Stories for Children" from "Freedom" (1950-1955). Stories from a left newspaper directed to a Black audience founded by Paul Robeson. Focuses on admirable figures from this country's history of liberation struggles. - "High John the Conqueror" from "Black Folktales" by Julius Lester (1969). A great example of the nearly worldwide tradition of oppressed people telling stories of outsmarting their oppressors. Because the story is set during the period of slavery and is written by a Black author for Black kids and their parents, it makes free and historically accurate use of the n-word, which means it would not be suitable for non-Black parents to read aloud to their kids. Give it to a kid who is an independent reader and who is aware and mature enough to understand why that's not our word to use. An anthology of strange, unusual, puzzling, and sometimes funny stories covering themes of socialism, environmentalism, business, economy, labour, unions, imagination, African-American heroes, racial discrimination, and peace. Since June is Pride Month, look for "X: A Fabulous Child's Story" by Lois Gould, first published in 1978. Some of the authors and illustrators are familiar, including Lucille Clifton, Syd Hoff, Langston Hughes, Walt Kelly, Norma Klein, Munro Leaf, Julius Lester, Eve Merriam, Charlotte Pomerantz, Carl Sandburg, and Dr. Seuss. Others are relatively unknown today, but their work deserves to be remembered. (Each of the pieces includes an introduction and a biographical sketch of the author.) From the anti-advertising message of Johnny Get Your Money’s Worth (and Jane Too)! (1938) to the entertaining les Some of the authors and illustrators are familiar, including Lucille Clifton, Syd Hoff, Langston Hughes, Walt Kelly, Norma Klein, Munro Leaf, Julius Lester, Eve Merriam, Charlotte Pomerantz, Carl Sandburg, and Dr. Seuss. Others are relatively unknown today, but their work deserves to be remembered. (Each of the pieces includes an introduction and a biographical sketch of the author.) From the anti-advertising message of Johnny Get Your Money’s Worth (and Jane Too)! (1938) to the entertaining lessons in ecology provided by The Day They Parachuted Cats on Borneo (1971), and Sandburg’s mockery of war in Rootabaga Pigeons (1923), these pieces will thrill readers intrigued by politics and history — and anyone with a love of children’s literature, no matter what age. If, god forbid, we had children, these would be the types of stories we would read to them. I enjoyed the stories about workers' rights and unions quite a bit. Not all, however, weather the test of time so well. The ABC poem that pledges allegiance to Stalin was a little startling. "X: A Fabulous Child's Story," meanwhile, promotes the early feminist notion that there is no biological construct for gender, a theory now mostly abandoned. These "Tales for Little Rebels" must still strike a nerve w If, god forbid, we had children, these would be the types of stories we would read to them. I enjoyed the stories about workers' rights and unions quite a bit. Not all, however, weather the test of time so well. The ABC poem that pledges allegiance to Stalin was a little startling. "X: A Fabulous Child's Story," meanwhile, promotes the early feminist notion that there is no biological construct for gender, a theory now mostly abandoned. Great idea for a book! I was happily surprised to find this book come across the desk. The introductions to each "tale" were a bit dry, and definitely meant for adults not children (also evident in that the book was placed in the adult nonfiction collection). I liked the alternative takes on childhood books and especially liked the drawings/pictures/poem-based stories. A fun read -- good chapters on grassroots environmentalism and communist children stories. A fun read overall! Teton Co Library C Great idea for a book! I was happily surprised to find this book come across the desk. The introductions to each "tale" were a bit dry, and definitely meant for adults not children (also evident in that the book was placed in the adult nonfiction collection). I liked the alternative takes on childhood books and especially liked the drawings/pictures/poem-based stories. A fun read -- good chapters on grassroots environmentalism and communist children stories. A fun read overall! "explores how the political beliefs of famous mid-century American authors shaped their cherished stories, teaching children to question rather than obey authority, to stand up and out rather than conform, to develop critical thinking skills rather than seek redemption through prayer." I know that in the introduction, they explained that they didn't want to whitewash the history of radical children's literature, but as a parent reading this, I was hoping to find more tales that I could share with my daughter and less of a history lesson. Most of the tales are at the very least morally problematic to radicals, and many of the stories aren't *fun* to read. Many great (I suspect) books were taken out of context (stripped of their fonts and illustrations), then recontextualized historically and by genre of radicalism. This is academic mush. Use it as an overgrown bibliography. I was hoping for more stuff to read to my daughter as opposed to what might be used as a textbook in a children's lit class. There are some good pieces that I can read, but that's not the purpose of this book. Didn't finish this as I had to return this to the library. An interesting and varied collection, meaning I liked some and didn't others. I am looking forward to having time to picking this up again. came across it by chance... early 1900's radical children's stories? This is a very nice collection. Some great stuff in here by Syd Hoff (better known for his New Yorker cartoons) and Walt Kelly (known for Pogo). I actually recall very similar books from when I went to school so there was a kind of nostalgia for these unabashedly leftist leaning works. not what i hoped it would be, but still interesting.